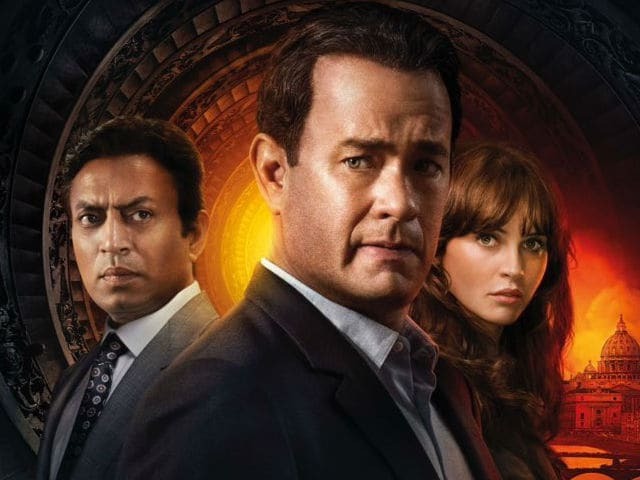 Inferno is a must for fans of Hanks. But watch it also for Irrfan Khan. Adapted from the Dan Brown bestseller of the same name, Inferno follows a template that was unveiled all of a decade back in The Da Vinci Code. All those years ago, it felt markedly out of date. Today, it has a thick cobweb-layer on it. Therein lies the principal problem with Ron Howard's Inferno. In spite of the undeniable all-round technical competence that the old team of director Howard, screenwriter David Koepp, cinematographer Salvatore Totino and composer Hans Zimmer bring to the enterprise, the film simply doesn't pack the sort of punch that one expects from a jigsaw-puzzle narrative. The thrills and spills that Inferno delivers have a ring of dull familiarity. The male protagonist Robert Langdon (Tom Hanks) is joined in the latest mystery fable (as he was the first time around in Paris by Audrey Tautou) by a younger woman (Felicity Jones). The latter helps Langdon decipher a trail of clues left behind by a billionaire bioengineer, Bertrand Zobrist (Ben Foster), who has rustled up a deadly virus aimed at halving the world's population. Inferno reveals occasional sparks to life, but the laboured tale of a crazed scientist who wants to launch an attack on humanity in order to prevent its imminent extinction has to be taken with complete suspension of disbelief, no less than the kind one would need to summon when watching any other Hollywood variant on a saviour-of-the-world saga. Cryptologist and art historian Langdon is, of course, no superhero and Tom Hanks is no action star. So, as the symbology professor hares through the streets and historic structures of Florence to save himself and the world with the help of Dr. Sienna Brooks, he has to bank entirely upon the twists and turns conjured up by Dan Brown's febrile and often baffling imagination to deliver the surprises that can keep the audience interested in what is unfolding on the screen. And that is no mean task because much of the hurly-burly comes across as too neatly rolled-out to be entirely effective. On Langdon's trail are both the Florentine carabinieri and the agents of a command unit of the World Health Organization. He has to dodge his way past and around many an adversary to get to the bottom of the conspiracy of mass annihilation. The race against time takes him briefly to Venice and, in an action-packed subterranean watery climax, to Istanbul. Langdon's mission is made all the more difficult by a grievous blow to the head. At the outset of Inferno, he has lost all memory of the immediate past. He finds himself being looked after by a fetching ER doctor in a Florence hospital but cannot recall how and why he got there in the first place. When an armed policewoman, Vayentha (Ana Ularu), barges into the medical facility gunning for Langdon, the latter is helped by an alarmed Sienna to flee. The two must now unravel the pointers strategically placed in their path by the now-dead villain, a moneybag exasperated with the worldwide inaction over the rapid growth of the human population. The Dante-spewing Zobrist's throwaways draw inspiration from the works of medieval Italian writers and painters. Deciphering them would be all in a day's work for Langdon if only his path weren't strewn with life-threatening dangers. Released in India two weeks ahead of the US, Inferno is available to audiences in this country in Hindi, Tamil and Telugu. While that may be a recognition of the growing importance of this market, the early release may also indicate the relevance of the film's theme. India is sitting on a population bomb as big as any and Inferno could serve as a cautionary tale of a twisted kind. Irrfan Khan, who plays the shadowy Harry Sims 'The Provost' of a secret security agency that works for any client who has money to spare, has dubbed his own part in Hindi. Mumbai actor Sahil Chadha has lent his voice to Hanks in the Hindi version. Tom Hanks' intelligence as an actor lends a degree of gravitas to the central character even when Langdon is in the least convincing of situations. Irrfan, in sparkling form, bolsters an exceptional star turn with a deft blend of menace and humour. Also in the film's fascinatingly multinational cast are the UK's Felicity Jones, Denmark's Sidse Babett Knudsen, Frenchman Omar Sy, and Romania's Ana Ularu, among others. While Foster and Jones pull their weight to perfection, it is Knudsen who proves to be the big scene-stealer. Her role expands in the film's last quarter to straddle a gamut of emotions and she nails it with impressive skill. Inferno is a must for fans of Hanks. But watch it also for Irrfan. Steady as a rock, he doesn't put a foot wrong despite being in a predictable film that doesn't get everything right.